Texas State University started their Saturday with a 3-1 win over the host team North Texas before ending the invitational losing a 3-0 final to Nevada. The Nevada Wolf Pack maintained control in all three games and finished the day with an attack percentage of .446 to .129. 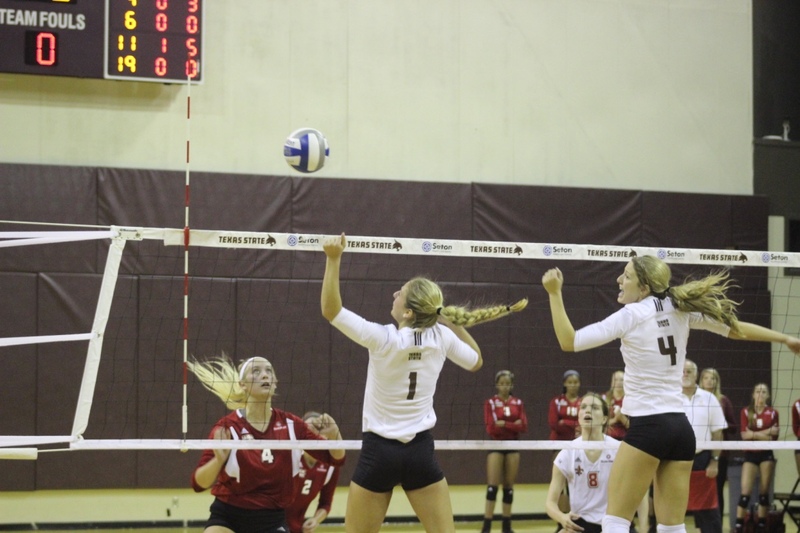 Megan Porter led Texas State with seven kills, while Jordan Kohl added four and Kelsey Weynand had three. Texas State will face off against Baylor on August 30. Photo by Kiersten Ehr. Nevada jumped in front with a 7-1 lead in the first set and the set didn’t come closer than 5 points with Nevada taking it 25-15. In the second set, the Wolf Pack scored seven consecutive points to take a 7-1 lead after Texas State scored the first point. The closest that Texas State would get is 4 points down and the Wolf Pack went on to win 25-13. In the third set, the Bobcats scored two points on a kill by Morgan Lewis and an attack error by Nevada to pull within 1 point at 5-4, before the Wolf Pack went on a 9-1 run to take a 14-5 lead. Texas State came back to within 17-13 on a kill by Jaliyah Bolden before Nevada closed out the match outscoring Texas State 8-6 and won its third straight set by a score of 25-19. The Bobcats won their first game of the 2016 season earlier in the day with a 3-1 victory over host team North Texas. The two teams split the first two sets as Texas State opened the match winning the first set 25-17. North Texas answered when the Mean Green edged the Bobcats 25-22. However, Texas State came back to win the third set by a score of 25-17 and clinched the victory when they won the fourth set, 25-21. After splitting the two matches on Saturday, the Bobcats return to San Marcos and will host Baylor in their first home match of the season at Strahan Coliseum at 6:30 p.m. on Tuesday. Texas State also hosts the Creeds and Crest Classic on Sept. 2-3.